The next generation of major science programs face unprecedented challenges in harnessing the wealth of knowledge hidden in Exabytes of globally distributed scientific data. 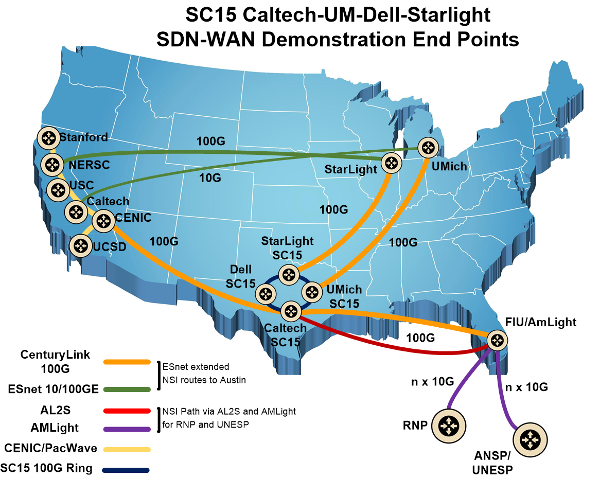 Researchers from Caltech, FIU, Stanford, University of Michigan, Vanderbilt, UCSD, UNESP and other partner teams have come together to meet these challenges by leveraging recent major advances in software defined and Terabit/sec networks, workflow optimization methodologies, and state of the art long distance data transfer methods. LHC Open Network Environment (LHCONE) is a globally distributed specialized environment in which the large volumes of LHC data are transferred among different international LHC data center and analysis sites. To date these transfers are conducted over the LHC Optical Private Network (LHCOPN) using dedicated high capacity circuits between LHC data centers via LHCONE L2+VRF services. The LHCONE Point2Point Service is planning to future-proof ways of networking for LHC – e.g., by providing support for OpenFlow. Using OpenFlow dynamic path provisioning and at least one Data Transfer Node (DTN) in the US connected to at least one DTN in Europe. DTNs are dedicated edge nodes that are designed for high performance data transport exclusively. A network services model that matches the requirements of LHC high energy physics research with emerging capabilities for programmable networking. Integrated programmable networking techniques, including the Network Service Interface (NSI), a protocol defined within the Open Grid Forum standards organization. Below is a diagram of the wide-area network topology in use for the University of Michigan for SC15. Both the above demos are utilizing this infrastructure. We would like to thank our corporate partners Dell, Adva, QLogic, Juniper and CenturyLink and well as ESnet, SciNet, and Merit Network. Without their strong support we would have been unable to undertake these demos.